When we were dreaming up this blog, one of our main objectives was to make this project collaborative. Our friends have great ideas and we try to make them happen. That means we talk about ice cream a lot. However, at the heart of it, the next two posts are pizza party themed. That’s right, we baked. We’ve been planning a pizza party for awhile and we wanted to do some flavors on the savory spectrum. One of our dear friends in Richmond, VA knows a lot about herbs and had many suggestions, including this flavor combination, based on a rosemary mocha drink she had at a local cafe. 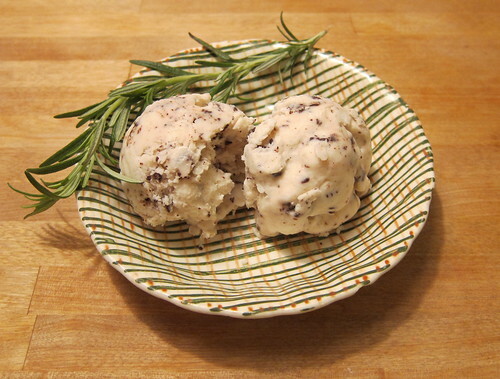 The herbal flavor cut some of the sweetness of the cream. Maybe it was just the visual suggestion, but there is a slight reminiscence of a mint chocolate chip ice cream. The rosemary complimented the many herbs we used on the pizzas and in the sauce. This was our favorite flavor so far! 1. The evening before, strain the yogurt in fridge. Freeze the machine’s bowl. 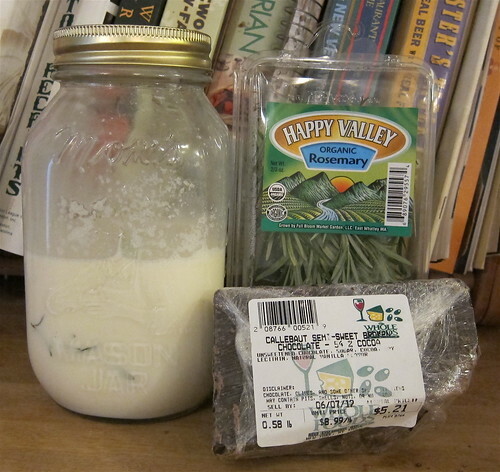 Put the milk, cream, and rosemary sprig in a resealable container to cold infuse overnight in the fridge. 2. 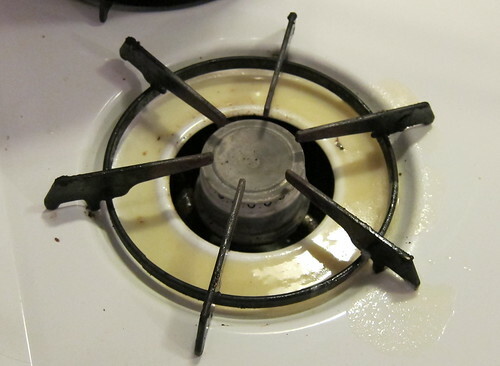 Mix about 3 tablespoons of the infused milk with the cornstarch in a bowl to make a slurry. 3. Whisk the cream cheese in a larger bowl until smooth. 5. Combine the remaining infused milk+cream, sugar, and cornstarch in a medium saucepan and bring to a rolling boil over medium high heat. Don’t remove the rosemary just yet. Also, don’t walk away- it will boil over quickly. 6. Once it has boiled for four minutes, take off the heat and remove the rosemary. Slowly whisk in the cornstarch slurry. Put back on heat and boil for about one minute until thickened. Remove from heat. 7. Slowly whisk the hot contents into the cream cheese until mixed. Add the strained yogurt and blend well. 8. Pour into a resealable plastic bag and chill in the ice bath for about half an hour. 9. Pour the yogurt into the frozen bowl and turn on. As it starts churning, pour in the chocolate shavings. Spin until creamy. 10. Pack in a storage container and press a piece of parchment paper against the top. 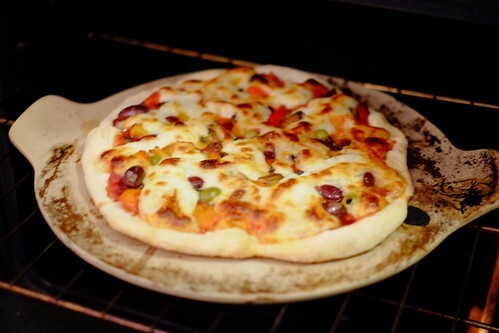 Put on the airtight lid, and store in the back of the freezer for about four hours or until firm. 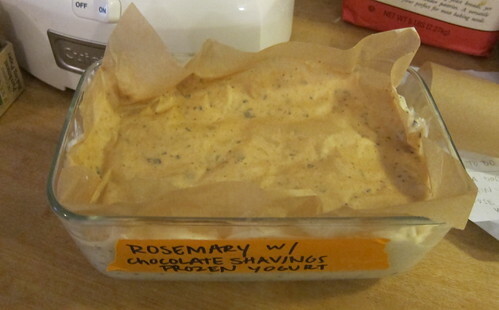 This entry was posted in Recipes and tagged Chocolate, Frozen Yogurt, Ice Cream, infuse, Pizza, Rosemary by lessdelicate. Bookmark the permalink. Question for you. Do you feel this recipe would be just as delicious with out the chocolate shavings? Thanks! Thanks for the interest! Good luck with your pint!